Named for the reddish tail that, in good light, can be seen from a great distance. Other names: Buzzard, hen hawk, mouse hawk, chicken hawk. Hunting habits: Soars in sky watching for prey in open country, or probably more often watches for prey from a perch. Rodents are main prey–also grasshoppers, rabbits, moles, shrews, weasels, skunks (most birds have no sense of smell), porcupines, feral cats, many medium-sized and small birds, snakes, lizards, frogs, toads, salamanders, crayfish, small fish caught at the edge of the water, and large insects. 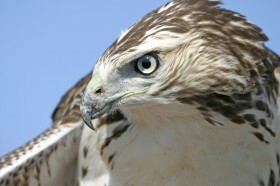 Red-tailed Hawks have been killed when the rattlesnakes and weasels they caught fought back. Migrating Habits: Like most buteos, Red-tailed Hawks are excellent soaring birds. They will take advantage of updrafts (especially thermals) to save energy while migrating. During peak migration dozens of them may be seen circling in kettles. Nesting habits: Bulky stick nest, often decorated with sprigs of evergreens; sometimes nests on a cliff. Female incubates the 2-3 eggs for a month while the male brings her food on the nest. The young first fly when they are 6 or 7 weeks old. Weight: Ranges from 710 to 1550 grams, with females generally larger than males. In the world of raptors, females are bigger, stronger, and usually more aggressive than males. Life expectancy: 9-year old originally banded at Hawk Ridge was recaptured at nearby Moose Mountain. Other wild Red-tailed Hawks have lived over 16 years, one to 21 years, 6 months. Captive ones have lived to 29 years.